Reasons for concern: This fast growing grass readily outcompetes native species, reducing plant diversity and wildlife habitat. It begins to germinate in the winter and quickly completes its life cycle, drying out, and posing a serious fire risk to homes and environments in May and June, when fires are more likely to occur. It has destroyed entire environments. It is a prolific seed producer, repeatedly producing additional seeds throughout the growing season. It can quickly form dense stands. Botanical description: Grows solitary or tufted (in dense bunches). Leaves: Leaf sheaths and flat leaf blades are densely covered with short, soft hair for a short time in early spring. Stem(s): Fuzzy and slender. Grows mostly upright 2 inches to 2 ½ feet tall. Seed heads: Have loose clusters of drooping flowers/seed heads at end of stem on one side. Mature seed heads have a reddish-purplish cast. Roots: Develops extensive, fibrous root system in winter in temperatures just above freezing. Overwinters as a seedling. Grows quickly in early spring. Where it grows: Widely distributed throughout North America, from deserts to mountain peaks. 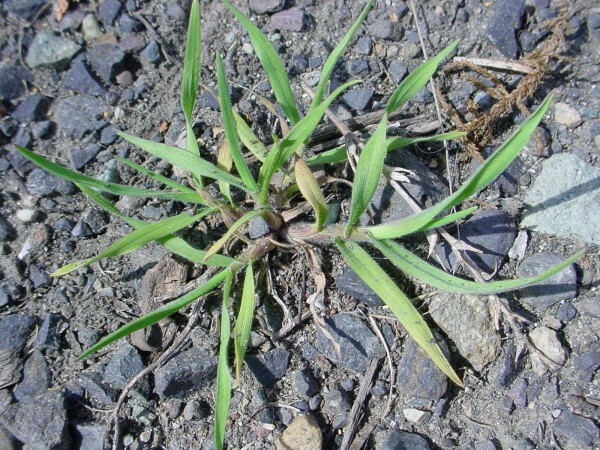 Quickly establishes itself nearly everywhere, in disturbed areas, grazed pastures, roadsides, along sidewalks, at new construction sites. Elevation 4,000 to 8,000 feet. 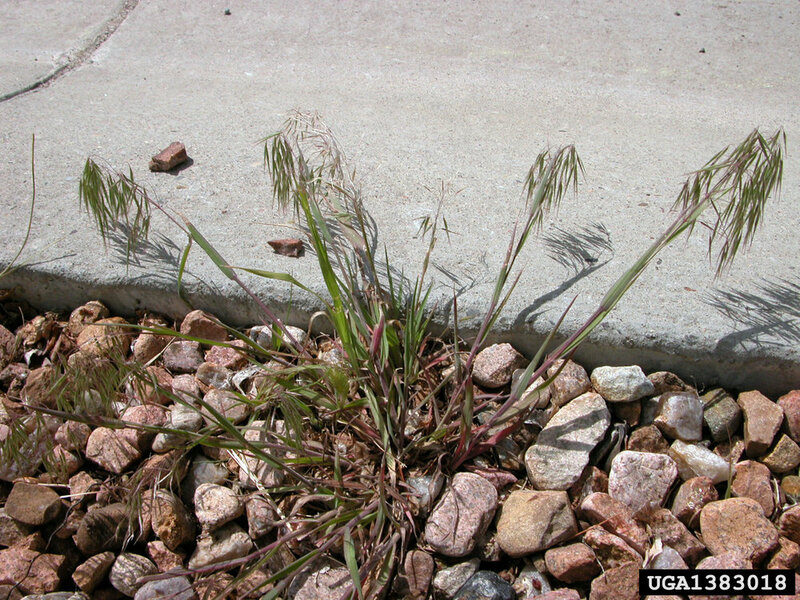 Weedy characteristics: Cheatgrass seeds prolifically, with seeds remaining in soil for 2 to 5 years. It grows very quickly in early spring because it has no competition from other plant species. Seeds are disbursed by wind, water, and animals. Grass parts get stuck in mouth and ears of pets and livestock (not to mention your socks). 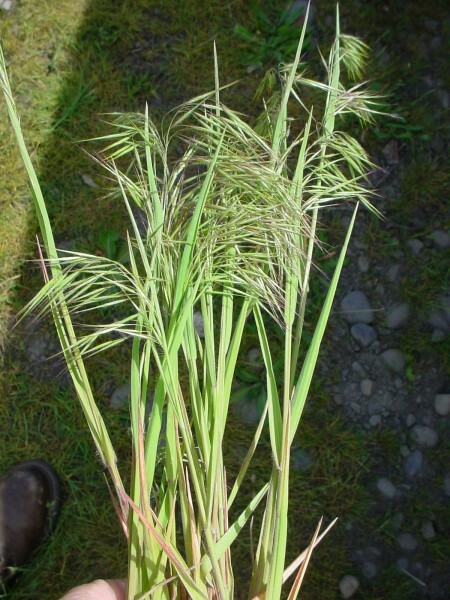 Look-alike native plants: Locally there are a few native brome grasses, such as Porter brome (Bromus porteri) or nodding brome (Bromus anomalus), but their populations are miniscule compared to those of cheatgrass. Control strategies: Do not let them go to seed. Hand pull or dig when plants are young. Be careful not to disturb the soil too much. Step down any loose dirt to prevent seeds from finding a welcome environment to germinate. Remember where cheatgrass grows from year to year, and revisit sites starting in March or April and throughout growing season. Possibly use weed barrier cloth or heavily mulch the area, if it is not too large. Plant desirable native species to outcompete invasives.